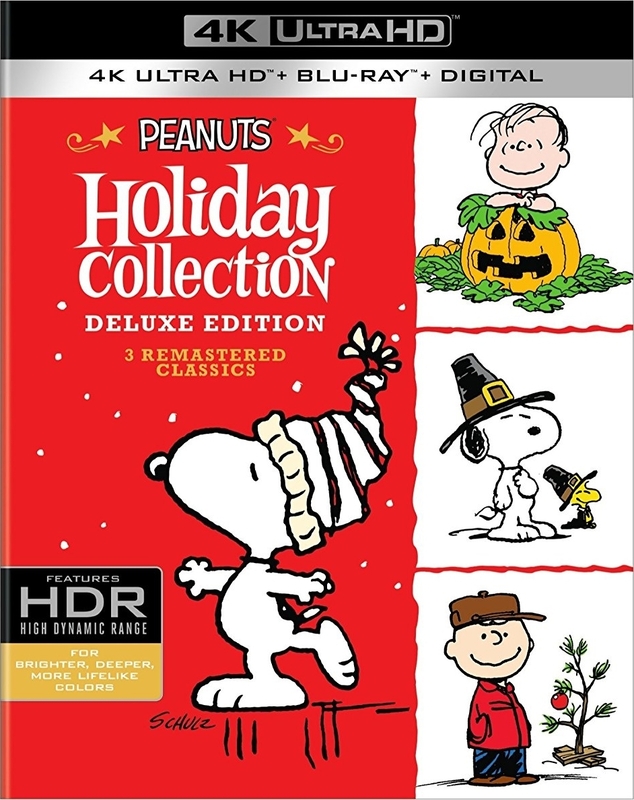 Everyones favorite Peanuts Holiday titles all in one set with the All-new Deluxe Editions! Will this Halloween be the one when the Great Pumpkin comes? Longtime believer Linus thinks so - and keeps watch all night in the pumpkin patch to welcome him. Charlie Brown gets into the spooky spirit too, dressing up as a ghost with more eyeholes than needed - but not scaring up the usual kinds of Halloween loot when trick-or-treating. Never fear, World War I fighting ace Snoopy is here to battle the Red Baron - and in doing so, crash Violet's Halloween party and Linus' vigil as well. The fun begins when Peppermint Patty invites herself and her pals to Charlie Brown's house for a REALLY big turkey party. Good grief! All our hero can cook is cold cereal and maybe toast. Is Charlie Brown doomed? Not when Linus, Snoopy and Woodstock chip in to save the (Thanksgiving) Day. With such good friends, Charlie Brown - and all of us - have so many reasons to be thankful. Christmas lights may be twinkling red and green, but Charlie Brown has the Yuletide blues. To get in the holiday spirit, he takes Lucy's advice and directs the Christmas play. And what's a Christmas play without a Christmas tree? But everyone makes fun of the short, spindly nevergreen Charlie Brown brings back - until the real meaning of Christmas works its magic once again.